Step up to the plate and get ready to take your best swing in one of the four cages. Choose between the two baseball (slow and fast pitch) and two softball batting cages (also slow and fast pitch). 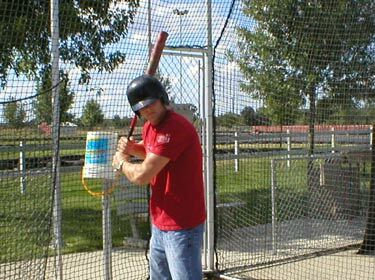 No matter what level you are at you'll have fun with the pitching machine challenging your every swing. Bring out your Baseball or Softball team for special prices and earlier times on the cages - call and ask how to reserve time for your team today.